An angler's guide to the best fly-fishing streams in Vermont, New Hampshire, and Maine. The complete angler's guide to the major watersheds of Massachusetts, Connecticut and Rhode Island. Second edition of this useful and informative guide to more than 100 waterfalls in the White Mountains region of New Hampshire. A perennial bestseller. 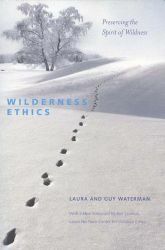 A thought-provoking treatise on preserving the spirit of wildness in protected wilderness regions. Includes a new Foreword by Ben Lawhon, Leave No Trace Center for Outdoor Ethics.